Remember we said that transformers are a simple “windings ratio” device? Connect two simple transformer-based DC controllers to a bit of track. Plug only ONE of them in. 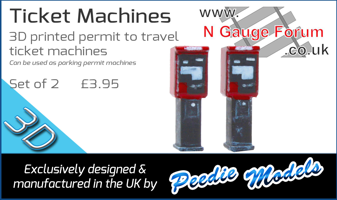 Carefully using meter probes, measure the voltage on the pins of the unused plug! Why carefully? Because 240v becomes 15v or so... then 15v becomes 240v again! Ouch!" I could see this happening if the outputs were just straight unrectified, unfiltered AC but how many train controllers are AC. If filtered, smooth DC then no change on the other Tx. If rectified AC or pulsed power then usually you can get a short in one direction (seen this happen) due to the second bridge. Not even considering if the simple controller has a bit of electronics in between. Any thoughts on the possibilities of instant death? To be called pompous and arrogant - hell of a come down. I tried so hard to be snobbish and haughty. Sounds like nonsense to me. As noted transformers require AC to work. It's a standard warning, I've found the same in instructions for other model railway controllers such as LGB, Fleischmann. Presume it applies more to basic resistance controllers which are not usually totally smooth DC. Also remember that as you run locos on the track it will cause spikes etc. which could be picked and amplified by the other controller's transformer. Nick. 2016 celebrating the 20th anniversary of "Königshafen" exhibition layout! 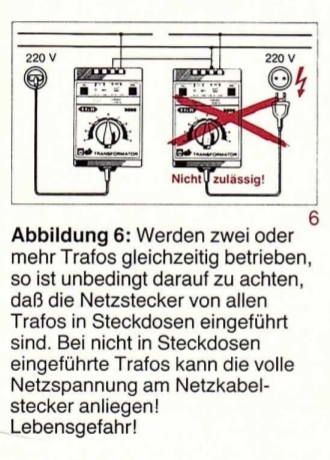 It's a standard warning, I've found the same in instructions for other model railway controllers such as LGB, Fleischmann. Gaugemaster ones have that warning too. At a guess, it's to cover their butts if the rectifier fails short circuit and does pass low voltage AC to a normally DC output. 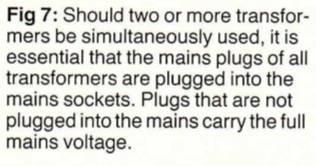 it would be a strange thing to do but the output of DCC is a form of alternating current and connecting a transformer the wrong way to its output may produce a high voltage if the DCC doesn't trip. Also many older model railway supplies had a 16ACV secondary output to power lighting that definitely would produce a high voltage output if stepped up by a transformer... .. I agree on both points above. However, the entire issue is hypothetical. In reality why would you connect a second transformer to the same section of track? My DC layout is powered by 4 vintage transformers, each powering a section which is totally isolated from the rest. Each section is an individual layout in it's own right. All of these transformers have 16V AC accessory outputs which I use for points and accessories. I certainly don't connect them to the track! I understand the track on a DCC layout has a constant AC potential across it, and therefore could be more prone to the unlikely problem, but I still reckon you'd have to be going out of your way to make it happen. Page created in 0.13 seconds with 42 queries.